OK, I will admit something. I write a sometimes depressing blog. It focuses on grand structures and spaces that once existed in the fair city of Knoxville, but which have fallen under the weight of the wrecking ball. I do this for a reason; awareness. My goal is to make the residents of this place recognize what all we have lost to misguided notions of progress, in order to prevent further losses. It seems like a never ending battle. Just when we think things are looking up for historic preservation, another demolition is put on the table (i.e. the row houses on Walnut St. or the Victorian houses on White Ave.). These places are irreplaceable, meaning once they are gone they are gone for good. For that reason, it took some convincing to get me to write this entry. This wasn't because the subject property wasn't grand or significant, but because it hadn't been leveled, paved, and striped. It hadn't even burned down (Leola Manning's Arcade Building Moan is about another building that stood on Union Avenue). To make a long story short, a friend of mine convinced me by pointing out that it might be nice to see a ray of sunshine every now and again. She was correct and as it turns out, this magnificent building had a run in with the wrecking ball and was very nearly transformed into a nice, flat surface for about 20 cars. Thankfully, that didn't happen. I met with the new owner of the property. Kevin and Melinda Grimac purchased it in the spring and Melinda was kind enough to show me around. I brought along some of the pictures you will see below and talked to her a bit about the building's history. They have big plans for the place and I will discuss their exciting news after we discuss the history here. 618 S. Gay Street has an interesting history. If one were to walk north on Gay Street, one might assume that the lot has always served a commercial purpose, being sandwiched between other commercial buildings. There is, however, one give away that this isn't the case. Right there, in the middle of the block is an alleyway. Unless I am mistaken, it is the only alley running east-west from Gay Street on any block. That may be because this parcel was once home to First Baptist Church of Knoxville. First Baptist began congregating in 1843 in the old Knox County Courthouse (not the one we know today). They built a small church on this spot in 1855. The congregation grew quickly, however, and began raising money to build a larger structure. They erected the above pictured church in 1888. The construction cost was $30,000. Every dollar they raised was matched by local business tycoon, W.W. Woodruff. This was the second and final church structure built on this spot. The sanctuary held 850 people. The spire was one of the most prominent features of the late 19th century Knoxville skyline. It reached 17 stories into the heavens. The congregation continued to grow to the point that First Baptist had to seek out less densely populated digs, building a new church on Main Street in 1923/24. It was in 1924 that the building we now know as the Arcade was erected on the site of the demolished church structure. Many Knoxvillians have likely heard of William "Parson" Brownlow. Mr. Brownlow was a journalist who had a paper called "the Whig". Under Mr. Brownlow, apprenticed a man who went by the moniker of Captain William Rule. Captain Rule started a paper in 1885 called "The Knoxville Journal." The Journal closed in 1991, but the name lives on today in a small publication out of North Knoxville. Captain Rule's Journal was noted for it's lack of sensationalism that was common among papers of the day. Normally a paper would skew toward one political leaning or another. Rule maintained political neutrality. In 1924, Captain Rule and his Journal located into the Knoxville Journal Arcade. The Arcade was designed by R.F. Graf, noted local architect who also designed the Miller's building, the Sterchi building, and the Chilhowee Park Bandstand (and original expo building). The building was an impressive edifice from the beginning, neoclassical in design and faceted with beautiful slabs of marble. The facade was spaced in to five symmetrical bays separated by grand Corinthian columns. The four outer bays were imagined as shop entrances, each having a window and a setback for a door. The central bay formed a porch-like entry for the main arcade. Vertically, the front of the builing presented two floors, separated horizontally by large copper panels. Atop the columns ran a large entablature emblazened with the words "The Knoxville Journal". The Knoxville Journal Arcade as it appeared shortly after construction. If one looks closely one can make out the names of the first commercial tenants, DeWitt Shepard Insurance, Pacific Mutual Life Insurance, and Flower Craft by Brockway Crouch (Crouch Florist is still in business in West Knoxville). Remarkably, the front of the Arcade is little changed from the day it was built. Let's count the changes 1) Shop bays are gone 2) The Journal script is removed 3) Those weird lights 4) The windows have been modernized 5) Front doors enclose the porch. That's not bad at all for an 88 year old building. A later shot, showing new tenant AAA and newly added awnings. AAA has moved on as have those awnings. A few more pictures from the front of the building. The short fellow in the center, that's David C. Chapman. He led the effort to establish the Great Smoky Mountains National Park. He is memorialized by the naming of Chapman Hwy. Also, note the new shop in this photo H.G. Cook and Co, an optometrist. That penthouse on top of the Arcade still exists and houses the office of attorney Greg Isaacs. The Arcade was originally built to house small commercial concerns in the front and the Knoxville Journal in the rear. The front portion of the building is the portion from which it takes its name "Arcade". Many cities sport a building of this variety (Asheville for instance has a particularly large arcade). Essentially, one might consider an arcade to be the forerunner of today's shopping mall. They usually had a central corridor with offices or shops to be rented. Knoxville's Arcade Building is no different. 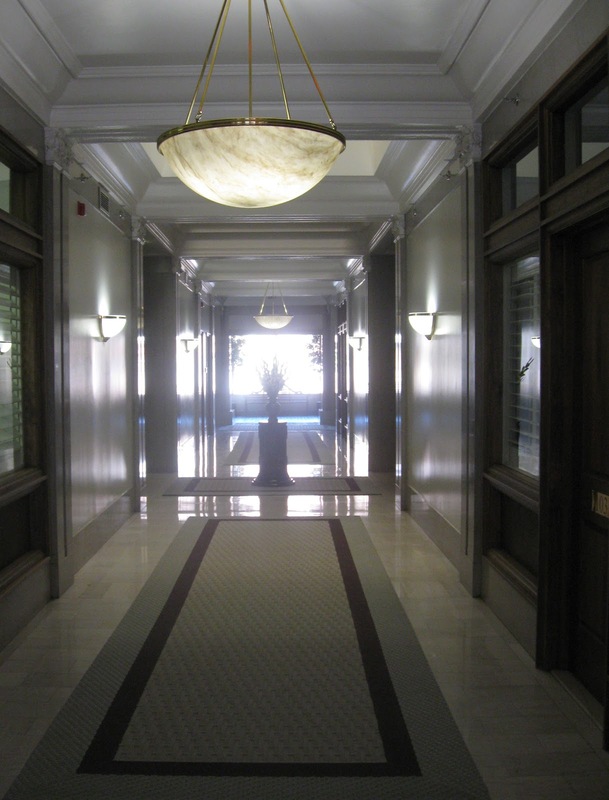 The front half of the building was configured as a central hallway separating two rows of offices or shops that could be reconfigured to suit different tenants. There were two floors. A large atrium type opening allowed light from a large skylight to illuminate the central hall. The building remains remarkably intact in this regard. The center hallway of the Arcade. Note the storefront style windows lining the sides and the atria providing light from above. At the end of the hall is the entrance to the Journal offices. The same perspective today. Not much different. Notice however, the Journal offices are now a large window. The openings to the sky light are still there (there's one more than when the building was constructed). The Knoxville Journal occupied the entire rear half of the building. At the end of the Arcade hallway, there were two stairs up to a pair of doors leading into the sales and production offices for the Journal. The space was two floors high, with upper office windows opening to the lower sales floor. Those offices were occupied by journalists and editors. The classifieds and subscriptions counters greeted a visitor to the Journal. This space was largely occupied by the advertising department. Looking back toward the entrance of the building. All of these shots were ordered by the Journal in 1925. Look at everyone pretending to work. The print presses and paper storage were located in the basement with the loading docks to the side, facing Church Avenue in the alley between the Elliot and Knoxville Business College. This would have put the docks for the Journal directly across from the rival News-Sentinel. Fortunes did not go well for the Journal in the late 1920's. The paper was bought by Luke Lea in 1928 and then went into receivership in 1930. The Journal left it's offices in the Arcade in 1928 to move to the Crimson Building at the corner of Gay Street and Commerce. The Crimson Building as it appeared in 1930. Sadly, like many properties downtown, time was not kind to the Arcade. AAA moved to Fifth Avenue, the Journal moved to the Crimson, and over time all of the tenants vacated. There was however one mainstay that opened in the northern two commercial bays, Blaufields deli. Blaufields operated in that spot for over half a century. It was the kind of place where blue collar workers could gather after work and have a Pabst Blue Ribbon. The grandeur of the Arcade was eschewed by fake paneling and drop ceilings. A smell of grease filled the air. It was the kind of greasy place that downtown knoxville is lacking today. Blaufields survived the Gay Street makeover of the late 1980's and early 1990's, when the sidewalks were closed to inlay bricks (this necessitated the removal of the original glass sidewalk lights which once lighted the Arcade's basement). Blaufields would not, however, survive a lease dispute in 1990. The Arcade was 85% vacant when it's owners decided that it would better serve downtown as a parking lot. They were poised to tear the building down when the Aztex corporation bought the place to house their headquarters. The Arcade underwent an extensive renovation that revitalized the marble facade and restored the commercial space within. Unfortunately, in the name of parking, the production offices of the Knoxville Journal were demolished. One can still see the footprint of the stairs that once led into the Journal offices. Melinda tells me that the marble slabs that once made up the stairs are down in the basement. The reconfigured rear of the Arcade. This portion was added in 1990-91. It is concrete veneered in old brick. An adjacent wall showing the scars of building removal. I had a hard time finding any pictures which depicted the outside of the removed portion of the building. These aerial shots were all I could find. The production offices were a large portion of the building, so removing them from that hole must have been a great undertaking. They are gone now, but their removal has provided the remaining protion of the building with some viable parking. In this context, if that allowed the building to be saved in 1990, so much the better. 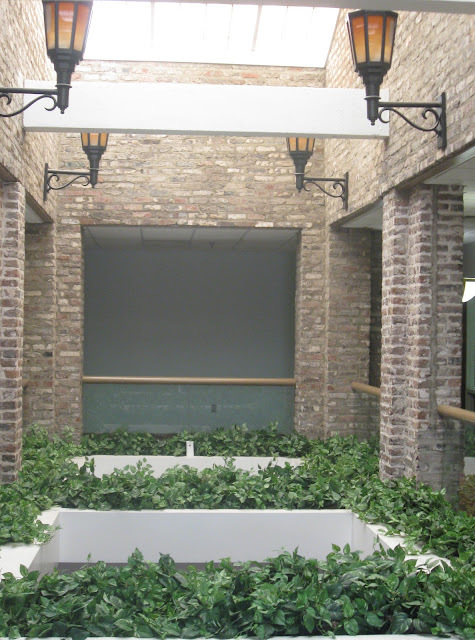 The 1990's restoration made a few notable alterations in the interior of the building. There had been a main restroom on the second floor, toward the front of the building. Those were removed and the space opened to the skylight. New restrooms were installed in the rear. An elevator was added in the new rear section, along with 4 floors of elevator lobbies. New light fixtures and carpet were added inside, along with the universally disdained lamps on the front of the building. The Arcade now stands as an example of what can happen when a beautiful old structure is saved and reused. The details inside and outside would be impossible to recreate today on an economical scale. The materials used within are rock solid. It really is a treasure. Things are looking up for the Arcade building. It could not have found itself in more capable caring hands than it did with the Grimacs. Melina, who works with Alliance Southeby Realty, shared with me her plans for the future. She wants to update the interior of the building as tastefully and faithfully as possible. The updates will call for some reconfiguration of the commercial space inside, but I showed her the original design plans for the building which pointed out that the space was meant to be reconfigurable. She and Kevin intend to build out their dream home in a portion of the second floor. The basement will be divided into office suites with a mind toward solo-practitioner attorney's, CPA's, and the like. Takers on that option will be able to rent small offices with access to conference rooms and the amenities provided by larger office spaces. The big news, however, comes with the building's first retail commercial tenant. For the first time since 2004, Gay Street and downtown Knoxville will be home to a jeweler. 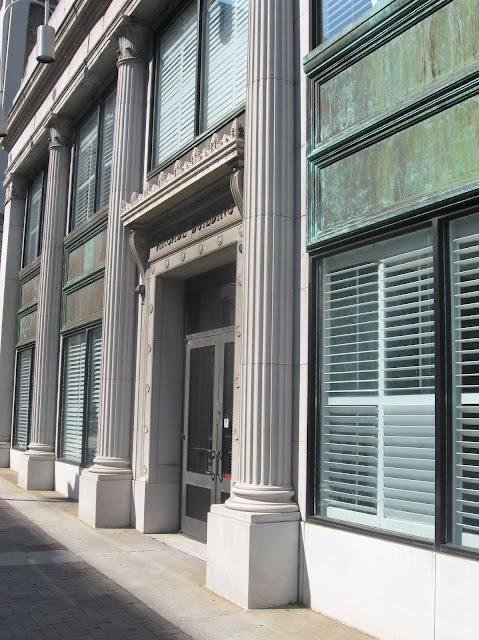 Rick Terry Jewerly designs has signed a lease for the southern commercial portion of the Arcade building. Rick Terry is a local, Knoxville raised jeweler and has been providing jewelry designs to Knoxville since 1986. Currently, he has two stores; one is in West Knoxville, the other in Lenoir City. Most exciting to this amateur historian, is that Mr. Terry is well versed in the history of the jewelry trade in Knoxville. He once sold his wares in the Knoxville institution that was Diftler's Jewelry (the second to last jeweler downtown), but it gets even more interesting. Mr. Terry is bringing the Diftler's Mosley safe to the downtown store. This safe was originally installed in the Diftler's store in the 200 block of Gay Street, by the F.M. George company. That block no longer exists (as we discussed in the last entry it's now the Country Music Park). The safe was moved to 503 Market, The Arnstein building, when Diftler's moved to that location. After Diftler's closed, Mr. Terry acquired the safe and placed it in his Lenoir City store. The safe will be returned to Gay Street with the opening of the new store, and will be moved there by the company that installed it, F.M. George. All historic photographs were used with permission from the McClung Collection. A special thanks to Bay Loftis for the current photos. Another fabulous post! This time, I must admit, you have covered a property of which I knew almost nothing. Thanks. Also of interest to me on that block are the next two buildings to the south, which apparently are now owned by the same entity. I assume the green brick building on the corner (old KUB building) possesses the bones of the old Knoxville Light and Electric which would date it to the turn of the century. I also assume the building's original exterior was removed with the green brick replacing it. (Although it may just be a facade??) At any rate, the present forlorn emptiness of these buildings is sticking in my craw; I'd love to learn their history. And most importantly, what are the current owners intentions? Thanks for the comment Art. I've done a limited amount of research into the neighboring buildings. Both buildings were at one time part of the KUB complex. The brownish building is a victorian era building with an updated facade (including pebble filled windows and doors). As best as I've been able to unearth, the green building is not old (as is widely rumored). I've seen into it's foundation and it appears to be constructed out of modern concrete cinder blocks. It is also much larger than the old Knoxville Light and Electric building. That old building was about the same size as the brown building next door. I'm with you on the current state of the old KUB building. So much potential. Maybe with retail creeping south, something can happen there. Really enjoyed reading your blog. I actually just set and read all your old ones too though I must agree some of the older ones definitely are a bit more depressing. I understand however though that they are meant to be in some respects in order to show what we are losing; however, I really enjoyed you delving into the history of a busilding that I still can admire and walk by on a regular basis. I'd love to know more about the history of some of the older buildings in Knoxville.